Here is where I see things standing... The Sp500 is near the 14 SMA support, and starting a consolidation. Within the intraday, the Vix spiked pretty nicely. At one point seeing a +10% gain, but ended the day with a lot less flare. 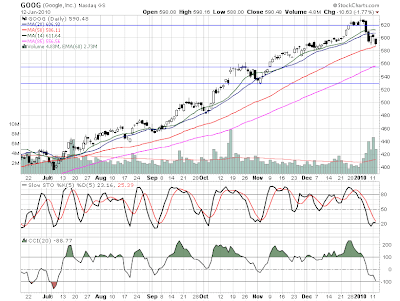 The combination has me thinking the market can go to the 62SMA. Google is consolidated and looks really interesting here. I still think the Weekly chart indicated a 'buy' w/the 10SMA, the fact that the daily indicates a buy point, makes GOOG that much more appealing. The fact that GOOG is probably going to exit the China market matters little to me. The China contribution is not material at the moment. I actually like the fact that they are sticking up for their position.